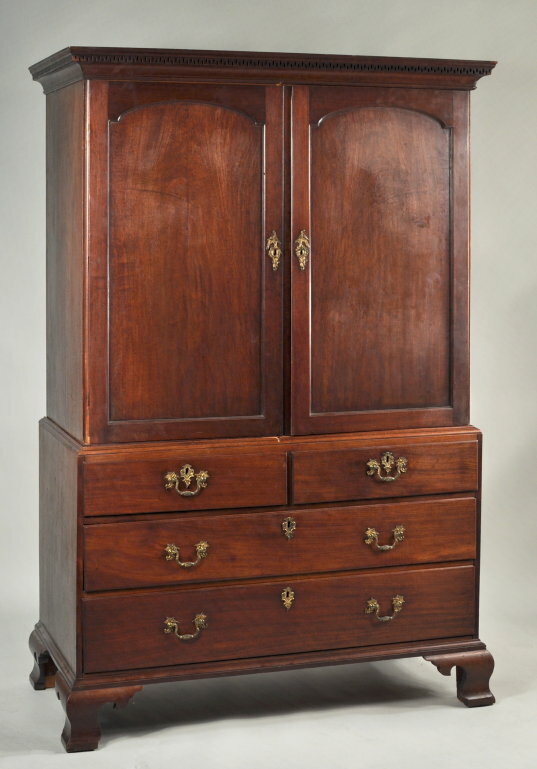 Exceptional georgian carved and figured mahogany linen or clothes press, with dentil molded coved cornice above two inset paneled doors with arched tops, opening to fully fitted interior with original linen drawers, set on a base with two short and two long thumb molded drawers, raised on bold ogee feet. Rich, dense wood, with original color and original rococo fire gilt bale brasses and escutcheons. England, circa 1770-75. 74" high, 46" wide upper case, 48" wide lower case, 50" wide extreme, 22" deep upper case, 23" deep lower case, 25" deep extreme.